The Committee of Ministers' Deputies of the Council of Europe held its 1216th meeting on the 14th of January 2015. Within the frames of the agenda item "the Council of Europe and the Conflict in Georgia", the Permanent Representative of Georgia to the Council of Europe Mr. Konstantin Korkelia made a statement regarding the so called draft ''treaty on alliance and integration'' between the Russian Federation and the proxy regime of the occupied Tskhinvali Region. 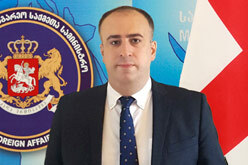 The Permanent Representative of Georgia emphasized that the Tskinvali region/South Osetia is an integral part of Georgia and any illegal military intervention or integration carried out by the Russian Federation constitute acts of aggression, occupation and de-facto annexation, which are directed against the territorial integrity and sovereignty of Georgia. The Permanent Representative of Georgia called on the Council of Europe member states to give due legal and political assessment to the yet another intention of the Russian Federation and to take relevant measures to prevent the signature of the document.